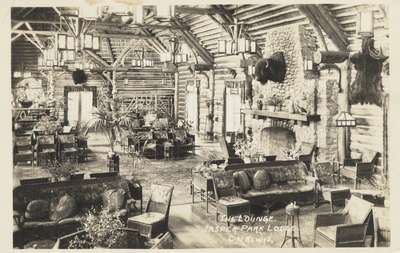 A postcard of the Lounge at Jasper Park Lodge sent to Mrs. R.B. Layton in Lacombe, Alberta from her son James (re-addressed to Bentley, Alberta). In June, 1922, Canadian National Railways officially opened Jasper Park Lodge. The main building was touted as the largest single-storey log structure in the world. Have a train of about 90 cars our stock [i.e. livestock] is about 75 cars away. We went through the rockeys [sic] on the top of a Caboose in our B.V.D's. Haven't seen our stock yet.